Rolling Rings are also known as Trinity Rings or Russian Wedding Bands. They are a unique and timeless designs that add meaning to a traditional wedding band. A Rolling Ring typically feature three rings, usually made of precious metals like 14k gold, 18k gold or platinum, that are intertwined together yet fit as comfortable as any other single band would fit. When placing a rolling ring on your finger, each band will “roll” over each other to the base of your finger and stay in its desired shape. 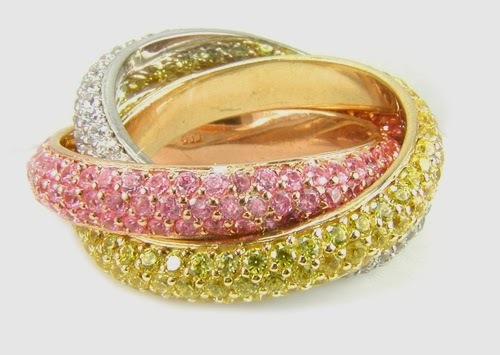 Another version of these great rings is the Trinity Ring by Cartier, that was created in 1924 by Louis Cartier and is said to represent pink for love, yellow for fidelity and white for friendship with their tri color gold bands of white gold, yellow gold and rose gold. Another popular version of the rolling rings are Russian Wedding Bands which represents the Holy Trinity – the Father, Son and the Holy Spirit. Whatever the meaning may refer to, the rolling ring style has become a classic favorite and traditional choice for today’s modern woman and man. Ziamond offers stunning Rolling Ring, Trinity Ring and Russian Wedding Band designs that are fashionable and available in many stylish custom options. Choose from solid 14k white gold, 14k yellow gold and 14k rose gold as a tri color ring or you may choose a solid color choice for all three bands including 18k gold or platinum. We offer plain gold bands, bands with pave set round lab created diamond quality cubic zirconia stones, and channel set round man made diamond look cubic zirconia in colors to match the corresponding gold band color. Our high quality Russian formula cubic zirconia is hand cut and hand polished to exact diamond specifications and includes a lifetime warranty. Combined with a solid gold or platinum mountings, our finished jewelry will surpass your expectations and become your new favorite accessory! This entry was posted in cubic zirconia, pave and tagged 14k gold, 18k gold, channel set, cubic zirconia, high quality, lab created diamond, man made diamond, pave, pave set, platinum, rolling rings, russian wedding bands, trinity rings, wedding band, Ziamond on August 1, 2013 by Administrator.